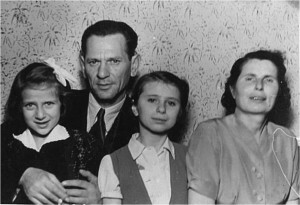 From the left; Anita’s sister Susan, Father Pinchas, Anita and Mother Clara. Anita Raboi’s parents, Clara and Pinchas Reif, from Chernovitz, Romania, used extraordinary means to avoid extermination in the Holocaust. Freedom didn’t come to them after the war, as they ended up back in Communist Romania. There, they continued to be persecuted. They only achieved freedom 20 years after the war ended. As a child, Anita’s mother Clara Spirer became fluent in German, Yiddish and Hebrew. She later became a seamstress. Two of Clara’s sisters went to Palestine around the beginning of the war, joining a Zionist organization and learning how to work the land. Clara had two brothers who perished in the Holocaust. One of the brothers left behind his two children, who later went to Palestine and started Kibbutz Rosh Hannikra. Tragically, almost all of the Spirer extended family was murdered by the Nazis. Anita never knew her grandparents or most of her other relatives. Anita’s father Pinchas came from a family of eight siblings. He was forced to deal with the death of both of his parents at an early age, becoming an orphan at the age of sixteen. Knowing that he had to make a life for himself, he become a locksmith, while many of his younger siblings were brought to live in the local orphanages. Anita believes that Pinchas’ younger orphaned siblings were taken by the Russians to work in labor camps in a coal mine. Clara and Pinchas were introduced when Pinchas stayed in a room and board at Clara’s parents home. They were married shortly before the war and had a son in 1941. Now feeling the threat of the Nazi’s, the Reif family took refuge in the house of an affluent family whose wife hid the family to help avoid them being taken to a camp. For a period of time, Pinchas was able to pass as a German because he was able to speak fluent German, in addition to his blonde hair and blue eyes. This arrangement continued until the situation became too perilous for the matriarch of the family when Pinchas lost his job. They were finally found and taken to Transnistria labor camp, which was later liberated by the Russians. 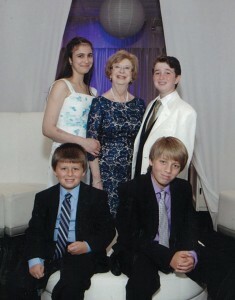 Anita and her Grandchildren. Standing from left to right; Sarah, Anita and Jacob. Sitting from left to right are Jared and Aaron. After liberation, they ran away, in an attempt to distance themselves from the Russians and Communism, hoping to go to Israel. Anita was just a baby when this happened. The Reifs made it to the Romanian border, but, it was closed, never giving them the opportunity to leave for many years to come. When Anita was about three, her brother died in a freak accident. Life in Romania was very hard and devastating for her parents. Anita never had a social life with other children and there were very few Jewish children left. The only way to leave the country was during certain small time frames where families could claim that they desired to join with other family. Pinchas applied for his family to go to Israel in 1949 and 1953, but was denied. In 1964, after first arriving in Italy for four months awaiting their visas, Anita and her family finally came to the United States when she was 19 years old. The Reif family then settled in Michigan where Pinchas’ brother was residing. Pinchas began by working with his brother who sent money to help other family members get out of Romania. Anita attended school at the International Institute where she learned English and received a job as a lab technician at the age of twenty. Anita would like those who visit this exhibit to know that she admires everybody’s strength, zest for life and for raising and educating their families.